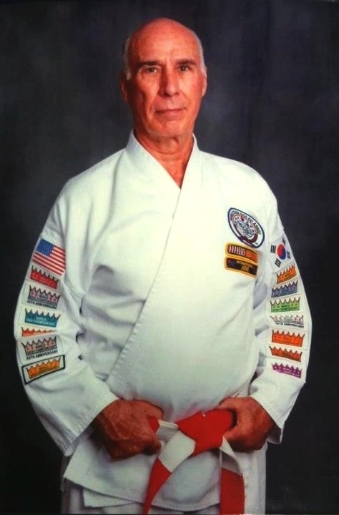 Grandmaster Beaudoin began his Tang Soo Do career in 1962 while stationed in the U.S. Air Force in Osan, Korea. �I thought Judo would be too easy, Hapkido too hard, but Tang Soo Do a challenge. I liked the discipline of Mr. Shin.� He earned his 1st Degree Black Belt on Mother's Day, May 12, 1963 at a test in Inchon Korea. His Dan number is 005661. His studies in Korea were the beginning of a life-long commitment to Tang Soo Do. During his tenure in the association, Grandmaster Beaudoin has been Secretary General for the World Tang Soo Do Association, active in the promotion of women, children, and family involvement; created the Karate Kids Olympics, a specially designed event for kids 3-12 focusing on breaking, forms, and sparring competition with an Olympic theme; and has fostered the growth of the Creativity teams and competition. Grandmaster Beaudoin's master�s thesis was on �Leadership.� It was a popular topic of his profession as a training consultant, and Grandmaster Shin was an inspiration to him, as he led our Association toward organizational effectiveness. Some of Grandmaster Beaudoin�s role models, in addition to Grandmaster Jae C. Shin, include Abraham Lincoln, Mother Theresa, and his students. Grandmaster Beaudoin is also a man who takes the time to learn. He has his BA in Political Science from the University of Connecticut (1968); an MA in Political Science from Trinity College (1972); and an Ed.D. in Adult Learning and Organizational Behavior from Argosy University of Sarasota (1976). He is also a veteran of the US Air Force from 1960-1964, and he studied Hapkido under Master Park while in Sarasota, Florida from 1975-6. He has put all this learning into practice in his job as a Training Consultant in Organization and Management Development. He has also been part time faculty for colleges and universities, as well as a presenter, speaker and seminar leader for domestic and international organizations. After investing so much time in learning, Grandmaster Beaudoin graciously spends much time teaching. �My favorite part of Tang Soo Do is Teaching the Karate Kids programs, the Tiny Tigers And Little Dragons classes. I also enjoy contributing to the International Black Belt Clinics following the World Championships. I will continue to train and serve in the WTSDA as long as students express the desire to learn, as long as people want to improve, wherever people yearn to reach their potential. The rewards coming to me can be seen in their eyes. There is no price on the value of a facial expression showing appreciation, gratitude and joy that comes from teaching another. One of my goals is to complete a Karate Kids Manual for our Association. Another is to continue promoting the practice of Ki Gong for health purposes to our elder population. In general, I would like to use our martial art skill and knowledge to foster healing and general well being." Grandmaster Robert E. Beaudoin received his promotion to the rank of 8th Dan at the 2010 World Championship in Greensboro, North Carolina. This historical event marks the first time that Grandmaster Jae C. Shin promoted one of his students to the title of Kwan Chang Nim. After the passing of Grandmaster Jae C. Shin on July 9, 2012, Grandmaster Beaudoin assumed the role of Grandmaster and Interim President of the World Tang Soo Do Association.